The Robert Rodriguez/Frank Miller production Sin City transforms Miller's series of graphic novels into a firecracker of a film. Visually arresting, alternately smug and gleeful in its brutality, the movie entertainingly delves guns blazing into adventures of the shadier residents of Sin City (actually, Basin City, as city-limit signs point out). The dominant feature of the film is its visual style. Sin City is shot almost entirely in black-and-white. I have seen a few sample of Miller’s artwork from the graphic novels. The screen version adds noticeable depth to Miller’s drawings, which always appear rather flat on the page. Rodriguez has paid a good deal of attention to the choice of lighting in the film. The shots are bright and dynamic when wrecked cars or bodies wheedle across the screen, or muted in shadow when a figure lurks in the background or cowers in a corner. The black and white is interrupted only by a few splashes of color introduced at choice moments: a soaring red Cadillac, the oddly green eyes of a doomed man. Throughout his career, Rodriguez has set out to use different techniques to get unusual shots, and Sin City continues this trend. A memorable scene focuses on the shadows of two people cast into a hallway as seen from an adjacent room. As the two characters continue the dialog, the camera rotates until the shadow stands right side up, leading to the conclusion of the scene. We know where the scene is going, and yet it unfolds on screen in an inventive way. The film uses another interesting effect a few times wherein silhouettes of the characters are shown in stark white, devoid of any other details. This effect - the name of which I have been hunting for but have been unable to find - gives a frozen feeling to the scene. The film is comprised of three separate vignettes, though common characters are woven throughout the story arcs. At the heart of each of the story segments is a tough-as-nails hero. There's Marv (Mickey Rourke), a loveable lughead who is out to avenge the death of Goldie, a prostitute who was murdered as she lay in bed beside him; Hartigan (Bruce Willis), a cop with a heart condition (of course) who on his last day on the job (of course) tries to stop a psychopath who has a taste for very young girls; and Dwight (Clive Owen), a reformed criminal who goes to great lengths to protect a very uneasy truce in the Old Town part of the city. These three main characters narrate each of their own arcs, coming across as gritty and all business, managing to not sound too corny when they spout things like "I'll die laughing if I know I've done this one thing right." Mickey Rourke as Marv comes out of nowhere to steal the whole film. Rourke's Marv sports a battering ram of a head and hulks through each of his scenes with a presence of a block of granite. As the action progresses, his oversized noggin is layered with progressing layers of scars and bandages. Rourke gives Marv a gristly steak of a voice and provides a steady stream of chuckles as the smashes his way through those who stand in way of his vengeance. Yet Rodriguez and Miller give Marv a heart. The destructive dynamo recalls about Goldie, "She smelled like angels oughta smell." Marv sets out on his path of revenge because Goldie had shown him kindness, however brief it may have been. Willis plays Hartigan in a straightforward manner, giving the world-weary detective just enough Bruce Willis-ness. Like Marv, Willis know the right thing to do and does it, even as he understands there will be hell to pay if he is able to set things right. I found the Clive Owen storyline the least enjoyable. It seemed to drag on a bit, but it also seemed to get bogged down in the details of the different forces at play in Old Town. Additionally, Rodriguez and Miller drop a few hints about Dwight's past but never explore it, and I found myself wishing that they had. Women help round out the cast and the plot, and they play interesting roles. The female characters happen to occupy the roles of the victims in the film, yet this seems to be because of the requirements of the plot, not out of any weakness inherent to them. The women of Sin City are anything but helpless, and provide some memorable characters. Lucille (Carla Gugino) is Marv's parole officer, and knows just where helping him out will get her. Rosario Dawson plays Gail, who Dwight describes as a valkyrie. The image of Gail licking her lips as she madly fires her gun is one of the film's strongest. YStill, two of the female performances strike a sour note. Jessica Alba plays a dancer who certainly looks like a million bucks as she gyrates on stage, yet she sounds flat and bland whenever she has a line of dialogue. Worse is Alexis Bledel as Becky, who I thought to be an odd choice for casting in this film before seeing it. Bledel seems completely out of place among the rest of the cast and in the subject matter. I considered that this may be due to the role that Becky plays in the film, but decided it was more. Bledel's presence was just not substantive enough to blend well with the rest of the film, and her inclusion in it ends up being distracting. Rodriguez and Miller undoubtedly want to capture the seamier side of life in Sin City, and they achieve this without question. Sin City earns every inch of its R rating. Strong brutality permeates the film. A few characters or two are beaten literally to a pulp. Some of the violence is wince-inducing, yet much of it gives way to grim humor at the same time, as when a character tries to peel the fingers of his own severed hand off his gun so that he can fire again. Yet the violence doesn't exist for its own sake. 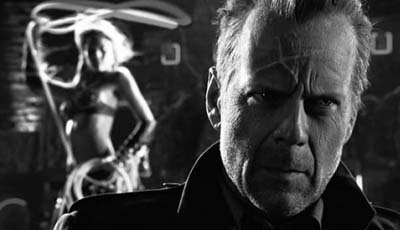 Rodriguez and Miller use it to color the denizens of Sin City and to serve as backdrop for the roughly heroic code of the three main characters. Never having been into the comic book/graphic novel scene, the fervor displayed by those who are truly devoted to the medium never fails to impress/scare me. Fanboys of Sin City will undoubtedly have their own unique views about how faithful the film treatment of the project was. The BOP feedback in-box will surely see more than a handful of emails on how I might have misrepresented something above. A project like Sin City should be able to speak to (if not entirely satisfy) devotees of the original work, as well as being able to entertain a wider audience that does not have the previous exposure. In this latter regard, at least, I think that Sin City prevails. Rodriguez and Miller create a unique, memorable environment peppered with lively characters, setting the action against a cinematic style that enhances but doesn't overwhelm the film as a whole.